Education professor Brenda M. Trofanenko says Americans' historical apathy is an indictment of the way history is taught in grades K-12. CHAMPAIGN, Ill. - As fans of talk-show host Jay Leno's man-on-the-street interviews know, Americans suffer from a national epidemic of historical and civic ignorance. But just because most Americans know more about "American Idol" than they do about American government doesn't necessarily mean it's entirely their fault. Americans' historical apathy is also an indictment of the way history is taught in grades K-12, according to a University of Illinois professor who studies and teaches historical instruction. 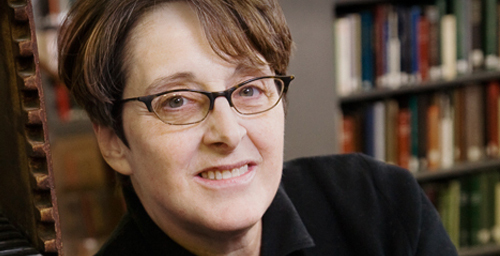 Brenda M. Trofanenko, a professor of curriculum and instruction in the College of Education, says that teaching history by rote - that is, by having students memorize historical dates and then testing them on how well they can regurgitate that data on a test - is a pedagogical method guaranteed to get students to tune out and add to our collective civic and historical cluelessness. "Everybody thinks of history as being really boring - and it is, if it's solely the recitation and recalling of facts," Trofanenko said. "The concern is always, 'Our kids don't know history!' But if we're just talking about the recall of facts and dates, that's not solely what you want to know about history." While Trofanenko does believe there should be a baseline body of historical knowledge taught in school, the memorization and recall methods of inundating students with red-letter historical dates neglects contextualizing those events within the broad sweep of history. "I agree that there should be a base knowledge that students need to know about their country and their community affiliations," she said. "But its relevance lies not just in knowing historical fact but being able to see what can be gleaned from historical inquiry, including cause and effect, progress and decline, and historical significance. You still have to know what happened, but you also have to be able to put it into a larger context of what was happening at the time, why it was happening, and what relevance it has to the current day." Facts and important historical dates, Trofanenko said, are easily measured and quantifiable through tests, which is why they remain so popular in elementary and secondary education. The emphasis on memorizing facts and dates has its roots in standardized testing and has only been given further pedagogical credence by the accountability measures of the No Child Left Behind law. "In elementary- and middle-school grades, history is one of many subjects of social studies, which is not a testable subject or focus of current NCLB laws," she said. "And if it's not testable, it's often not taught. Asking a student to write an essay explaining the moral dilemmas of the American Revolution can't be put into a bubble answer." Since the federal government uses only math and reading scores to measure a school's progress, there's little incentive for schools to teach students non-tested subjects such as history. But history, according to Trofanenko, "is just as important as everything else. Everything is set in time, and experiences typically change in significance over time." "If you were looking at the evolution of scientific knowledge," she said, "you would want to understand just how significant the Scopes trial was, and not just the result and the year it was decided. And, to further historicize, how that decision is still relevant to a science curriculum in modern-day Kansas. "So it's not just knowing facts but being able to place everything in a period of time so you understand how the past continues to inform current issues." While it's important to know facts and dates, Trofanenko believes history teachers should challenge students, especially high school students, to think like historians. "We need to start thinking differently about our students' abilities," she said. "They can think critically and engage in historical inquiry if they're actually given the opportunity. Instead, we make them learn facts and test them on their ability to regurgitate them at the end of the week. I think that's really insulting to them." Trofanenko believes that students today are a lot more critical than they were in years past. "With the amount of information that's out on the Internet, I don't think you can fool kids anymore," Trofanenko said. "They're much more savvy now about looking things up than they were even a few years ago. They're certainly critical about other things in their lives, so why can't they be critical of history as well?" Thinking like a historian, according to Trofanenko, entails studying primary source documents, thinking about the historical context, weighing the evidence and then making an argument - "something all high school students are capable of doing," she said. "That helps students develop a historical consciousness, which is the ability to ask why a particular historical narrative or a historical concept is advanced or not." Teaching students to look at history with a critical eye also helps students see past the jingoism than sometimes passes for history in classrooms. "History is used as a way to instill nationalism and patriotism and commitment to a country, and it particularly becomes strong when there's a threat against the nation, like in the United States after Sept. 11. But that often blinds everyone to unsavory historical events that have happened in the past. That's why it's important to foster a healthy bit of critical skepticism in students instead of training a generation of expert test-takers."